Quantum Golf, by Kjell Enhager, explores the feel of the golf swing, one’s own perception of effort, and the task of letting the club flow. The book concerns the adventures of a student and teacher, as they learn about golf, one another, and life. And each chapter concludes with golf tips that can be readily translated to tennis and/or to life. This excellent book can be just the thing to change your perspective and unlock the “secrets” of the serve. Enhager distinguishes between a classic swing and what he calls a “Quantum Swing.” The classic swing has all the correct biomechanical components, but is performed mechanically, and without rhythm. The quantum swing on the other hand, is produced without effort, and this “super fluid motion” results from the classic swing performed at the correct tempo and with minimum muscular tension. The following excerpts of Enhager’s golf tips have been rewritten for tennis. Changes in wording from golf to tennis have been italicized. Jim I purchased Quantum Golf and so far it has made me a very happy tennis player. Before I read the book I would analyze every shot and I mean really analyze it, if I hit a poor shot. If you have the strokes or you do not have text book strokes but can keep the ball in play during practice, but struggle when in competition this book is for you. Enjoyed the concept of effortless strokes. In physics, the power concept for tennis is to use angular momentum (down the kinetic chain with a reduction in the radius of the curve), like a spinning ice skater. You start with a racquet drop into a large curve from the legs and hips progressing along the chain to a small curve for the arm and racquet. The other key factor is the direction of the force along the body axis. Tennis is not played standing vertically upright. You need the body force to be at roughly 45 degrees in three dimensions to the incoming ball (or the intended direction for serves) i.e. for right-handers, up forward and to the right for serves and forehands versus up forward and left for backhands. Aside from the fact that Milos Raonic is tall with a fluid service motion, his more horizontal left-to-right action at ball contact allows him to finish closer to the 45 degree line than Federer or Djokovic (then the racquet evaporates away downwards). It’s a great model for an older player like myself who is limited by gravity and bad knees (rather than the rules*) to a jump-less serve. tried this today and it was magic, every first serve went over the net ( though some went long ) Used it also on groundstrokes, only hit a couple of backhands into the net, and that’s a real weakness for me. Held my racket loose until I needed to hit, and kept my muscles relaxed. For me this is one of the most amazing and effect tips I’ve ever had. There is an excellent, similar book about golf which can apply to tennis, as well. It’s called, “Swing the Clubhead,” by Ernest Jones. Jones lost his leg during the World War and was still able to play golf (talk about balance!) He went on to become one of the great golf coaches of all time. The book is available on Amazon and well worth the read. As a competitive athlete, I learned long ago that whenever torque is present, you’re doing something wrong and are out of step with nature. Your best podcast! Thank you! My favorite sports quote of all time is by Satchel Paige who said, “You gots to jangle when you walk.” I take this to mean that you have to be so relaxed that even at walking speed you have only a tenuous control over your bones. Don – can you imagine a Satchel Paige serve – perhaps a bit like if Baumgardner played tennis !! 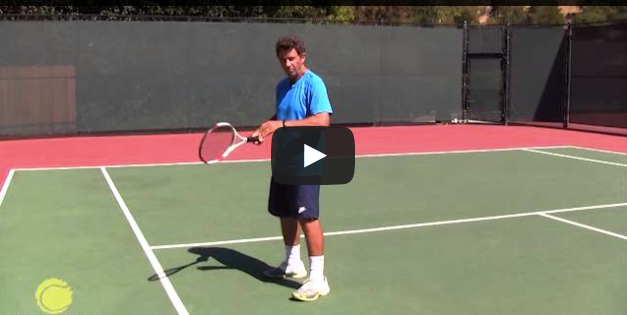 do you still offer coaching of serve via video of my serve? i am working on the same ideas in aikido [a Japanese martial art] that uses relaxed gripes, fluid motion, and relaxed shoulders, that seems effortless when done correctly. It allows the energy to flow through the feet, to legs, center, for power, just like tennis, without any tension to slam on the brakes of the power chain. I also am working on this in tennis. Jim — that is such a good tip… let the club or racquet do the work. The book is an interesting read for both golf and tennis players. Thanks for sharing. Will post it on our CTA web site.. I am determined to incorperqte the idea of effortless power into my game. Over the past year I have been practicing however it’s such a difficult concept to get as it’s very counter intuative. I know this is what I need to do but once I get into a match situation it seems to all go out of the window. Do you have any tips on keep the body loose during a match? Jim,this is a good concept so thanks for sharing it with us. I am in the process of changing my serve and it is very difficult to change bad habits. I agree that it feels better to hit a serve with rhythm no matter the placement. I can always get the ball in the service court if I use poor form and hit softly enough. I am sure my opponents appreciate those serves. Glad to here about the balance steely,will try ir right away!